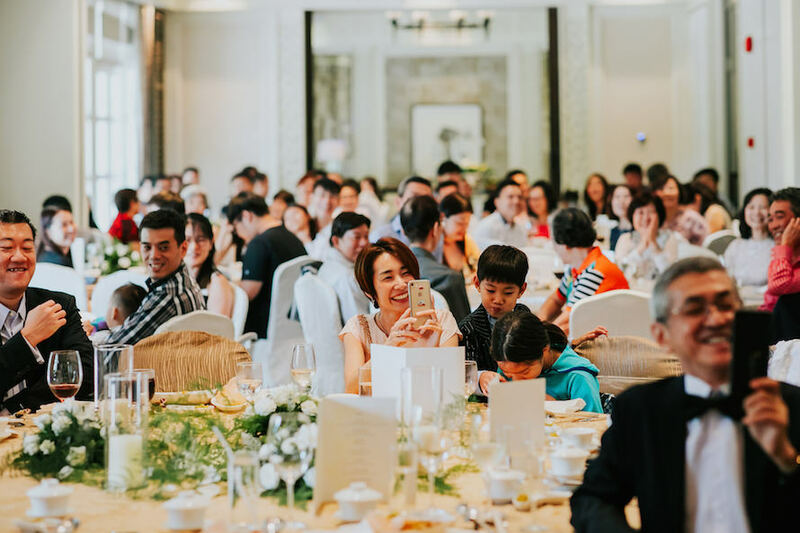 Jie Li and Mo Yin chose to hold two separate wedding celebrations, the first at Monti for their friends, and the second at Shangri-La Hotel for their relatives. In recent months, we’ve noticed that more couples are opting for such dual celebrations, and personally, we did that for our own wedding as well! It really holds true that bringing down the number of guests can truly make the celebration more intimate, and more time can be spent on interacting with each and every guests. As Monti is situated right on Marina Bay, Jie Li and Mo Yin upped the ante by arriving at the venue in style, via a bumboat from Marina Bay Sands, with their friends decked in outfits of iconic characters from Singapore’s olden days like the Samsui Woman, Coolie, Majie, Rickshaw Rider and Policeman in shorts. It was really a feast for the eyes as we rarely get to see these iconic costumes. Besides the joyous and celebratory mood of their wedding, we also got to witness the emotional side of things. Seeing their eyes welled up listening to their testimony of love for each other, and their loved ones shedding tears during their heartfelt speeches, really showed us the intricate fabric behind every relationship. These are the moments of vulnerability, for to love at all is to be vulnerable (C.S. Lewis).